Objective To describe the clinico-radiological phenotype of 3 patients harboring a homozygous novel AP4M1 pathogenic mutation. Methods The 3 patients from an inbred family who exhibited early-onset developmental delay, tetraparesis, juvenile motor function deterioration, and intellectual deficiency were investigated by magnetic brain imaging using T1-weighted, T2-weighted, T2*-weighted, fluid-attenuated inversion recovery, susceptibility weighted imaging (SWI) sequences. Whole-exome sequencing was performed on the 3 patients. Results In the 3 patients, brain imaging identified the same pattern of bilateral SWI hyposignal of the globus pallidus, concordant with iron accumulation. A novel homozygous nonsense mutation was identified in AP4M1, segregating with the disease and leading to truncation of half of the adap domain of the protein. Conclusions Our results suggest that AP4M1 represents a new candidate gene that should be considered in the neurodegeneration with brain iron accumulation (NBIA) spectrum of disorders and highlight the intersections between hereditary spastic paraplegia and NBIA clinical presentations. Here, we report 3 patients from the same kindred who harbor a homozygous AP4M1 mutation. They exhibit the typical clinico-radiological phenotype of AP4-deficiency syndrome, but surprisingly associated with bilateral pallidal iron accumulation on brain imaging, thus establishing a link between AP4-related complex HSP and NBIA disorders. The study was conducted in accordance with the Declaration of Helsinki and was approved by the local ethical committee. Written informed consent was obtained from the patients' legal representatives. Whole-exome sequencing (WES) was performed on the DNA from the 3 affected patients by Aros Ltd. Homozygous mutations common to the 3 patients were filtered progressively for their frequency (<1%), alteration of the open reading frame (frameshift, splicing, missense, and nonsense mutations), and ultimately for their localization in the homozygous regions common to the 3 patients. Sanger sequencing allowed for their confirmation and segregation study in the family. CT was performed on a 64-section CT scanner (Discovery750 HD; GE Health care, Milwaukee, WI). MRIs were acquired on a 1.5-T system (AVENTO; Siemens medical solutions, Erlangen, Germany) as follows: axial slices T2-weighted, T2*-weighted, fluid-attenuated inversion recovery, susceptibility weighted imaging (SWI) sequences, and sagittal slices T1-weighted sequences. The clinical features of the 3 patients originating from a large consanguineous Moroccan family (figure 1A) are described in table. Psychomotor retardation with spasticity of the 4 limbs was noticed early in life. Clinical examination from the first year showed spastic tetraplegia, with pyramidal tract signs and equinovarus. Patients IV-2 and IV-5 sat unaided at 7 months; patient IV-2 was able to crawl at 2 years but never managed to walk; her sister IV-5 could walk short distances with unsteady spastic gait from the age of 5 years. Patient IV-7 sat unaided at 11 months of age and walked at 3 years, with a broad-based unsteady gait. The patients exhibited stable severe mental deficiency, without behavioral disturbance. Motor achievements progressively deteriorated at adolescence, with loss of the highest motor skills, but without additional cognitive decline; from that time, bradykinesia, hypomimy, drooling, and athetoid movements of the hands were also noticed. Patients IV-5 and IV-7 displayed short stature. Dysmorphic features (figure 2, Aa, Ba, Ca) were also present. The 3 patients needed assistance to most common daily living activities. The following investigations were normal: electromyoneurography recording, cardiac ultrasound scan, visual and auditory evoked potentials, fundus examination, karyotype analysis on lymphocytes (cases IV-2, IV-5 and IV-7), PANK2 and PLA2G6 Sanger sequencing (patient IV-7), and analyses of mitochondrial enzymatic activities on a muscle sample (patient IV-2). Comparison of WES results performed for patients IV-2, IV-5, and IV-7 revealed 3 homozygous regions, 1 on chromosome 7 (5.7 Mb) and 2 on chromosome 9 (2.25 and 1.31 Mb). A total of 14,753 exonic variants were common to the 3 patients, and by progressively filtering them, we identified 4,974 homozygous variants, among which 2,546 were nonsynonymous, frameshift, splicing, or stop variants. Further filtering for damaging variants with a frequency lower than 1% identified 3 mutations in the AP4M1, HRNR, and NPIPL3 genes, but only the 1 in AP4M1 was located in chromosome 7, in 1 of the 3 homozygous regions. This c.916C>T mutation (rs369459721) is leading to a premature stop codon (p.R306X), truncating the last 147 residues of the protein (figure 1, B and C). It has a global allelic frequency of 2.4 × 10−5 in the ExAC and a frequency of 3.0 × 10−5 in Non-Finnish European and 9.3 × 10−5 in African, while it was not encountered in the rest of the world. Analysis of the homozygous variants located in the 10 known NBIA genes revealed 2 common variants, located in CP (rs701753) and PANK (rs3737084), but they were not damaging, had a frequency higher than 1%, and were located away from the 3 homozygous regions. 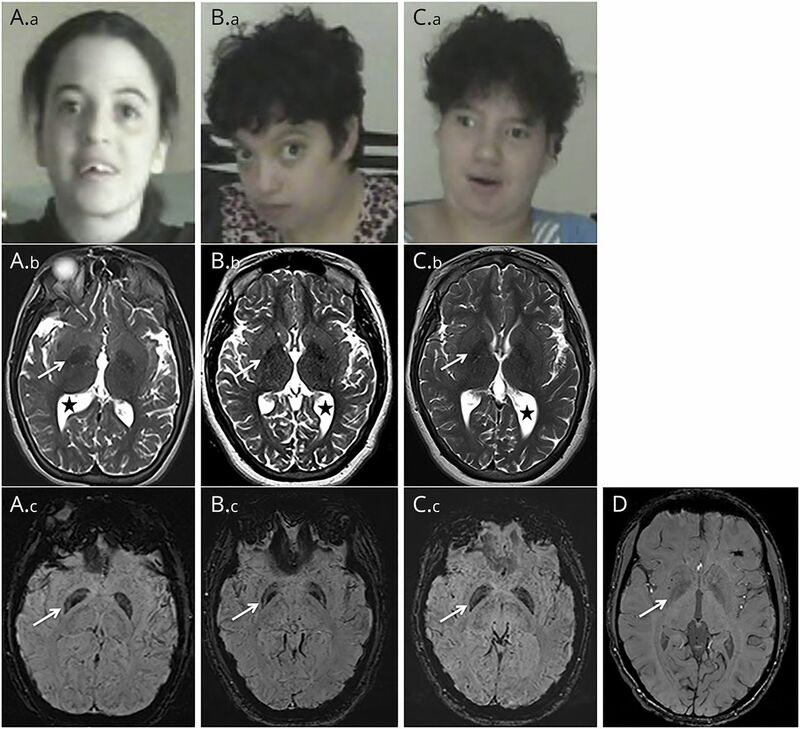 Brain MRI of the 3 patients showed global cerebral atrophy, white matter loss, asymmetric ventriculomegaly (figure 2, B, E, and H), and thinning of the splenium of the corpus callosum (data not shown J). T1 sequences showed an isointense pattern of the globus pallidus (data not shown). T2 sequences revealed symmetric mild hypointensity of the globus pallidus, which was significantly accentuated on SWI sequences (figure 2, Ab, Ac, Bb, Bc, Cb, Cc, D). Patient IV-7's CT was normal (data not shown). We identified a homozygous nonsense mutation in AP4M1 in 3 women from the same inbred family by WES. This R306X mutation deletes the last 147 residues of the protein, truncating half of the adap domain, an effect similar to that reported in 2 other families who harbored a stop codon truncating the AP4M1 protein at positions 318 and 338.9 Until now, only 5 different AP4M1 mutations have been reported in 7 families with a common clinical presentation4,5,9,13,–,15 (figure 1C). The 3 patients from our study share the same clinical phenotype with variable severity, consisting in early-onset developmental delay, tetraparesis, juvenile motor function deterioration, intellectual deficiency, athetoid upper limb movements, bradykinesia, and mild dysmorphism, which fits with the previously described AP4-deficiency syndrome. Even if the bilateral pallidal hyposignal is mild on T2 sequences and could be interpretated as physiologic iron accumulation at this age, the substantial hyposignal on SWI is totally unusual in patients of the same age. These findings, correlated with the absence of hypersignal on T1-weighted imaging or CT hyperdensities in the patients, are strongly suggestive of brain iron overload. Iron deposits have not been previously reported in patients with AP4-deficiency syndrome. Nevertheless, magnetic susceptibility sequences, which can confirm the presence of iron, have not been performed in most of the reported cases; therefore, this feature might have been underdiagnosed. A search for homozygous mutations common to the 3 patients in the 10 published NBIA genes revealed 2 variants located in PANK and CP, but their frequency and the absence of pathogenicity were somehow incompatible with their involvement as modifier mutations switching HSP clinical presentation to NBIA. Of interest, a patient with AP4E1 mutations, whose brain MRI showed bilateral T2-hypointensity of the globus pallidus, has already been described.8 This peculiar finding, although not discussed in the article, strongly suggests iron accumulation in this AP4E1 patient, as in our 3 AP4M1 patients. Moreover, NBIA disorders are probably underdiagnosed, and the evolution of technologies and practices in radiology leads to the identification of many new candidate genes through the incorporation of susceptibility weighted sequences more frequently in the brain imaging protocols.19 Our study has limitations, especially because of the small sample size. Nevertheless, according to our findings in AP4M1 mutated patients, we recommend that brain MRI with susceptibility weighted sequences be included in the brain imaging protocol for patients with suspected HSP and AP4-deficiency syndrome to collect a larger group of patients, and we propose that mutations in AP4 genes be considered and screened in a subset of patients with NBIA spectrum disorders. Design or conceptualization of the study: Agathe Roubertie, Christian P. Hamel, and Guy Lenaers. Analysis or interpretation of the data: Charles-Joris Roux, Nicolas Leboucq, Gael Manes, Majida Charif, Bernard Echenne, Cyril Goizet, Claire Guissart, Pierre Meyer, Cecilia Marelli, François Rivier, Lydie Burglen, and Rita Horvath. Drafting or revising the manuscript for intellectual content: Agathe Roubertie, Charles-Joris Roux, Cyril Goizet, and Guy Lenaers. A. Roubertie, N. Hieu, C.-J. Roux, N. Leboucq, G. Manes, M. Charif, and B. Echenne report no disclosures. C. Goizet has served on the scientific advisory boards of Amicus Therapeutics and Sanofi Genzyme and has received travel funding/speaker honoraria from Sanofi Genzyme, Amicus Therapeutics, and Shire. C. Guissart and P. Meyer report no disclosures. C. Marelli has received travel funding/speaker honoraria from Actelion Pharmaceuticals. F. Rivier, L. Burglen, and R. Horvath report no disclosures. C.P. Hamel is deceased; disclosures are not included for this author. G. Lenaers reports no disclosures. Full disclosure form information provided by the authors is available with the full text of this article at Neurology.org/NG. The authors acknowledge the patients and their families for participating in the study. They thank La Fonation Maladies Rares et Retina France. They are indebted to the INSERM and CNRS and the Montpellier University for their institutional supports. They thank the Region Pays de la Loire, Angers Loire-Métropole, University of Angers, and University Hospital of Angers for their support to the PREMMI project. They are indebted to Dr. Lagavulin for helpful discussions. The Article Processing charge was funded by the Montpellier Hospital. Accepted in final form December 10, 2017.
. Hereditary spastic paraplegias with autosomal dominant, recessive, X-linked, or maternal trait of inheritance. J Neurol Sci 2012;318:1–18.
. Genetic and phenotypic characterization of complex hereditary spastic paraplegia. Brain 2016;139:1904–1918.
. AR ticle mutation in the AP4M1 gene provides a model for neuroaxonal injury in cerebral palsy. Am J Hum Genet 2009;85:40–52.
. A novel AP4M1 mutation in autosomal recessive cerebral palsy syndrome and clinical expansion of AP-4 deficiency. BMC Med Genet 2014;15:1–7.
. Adaptor protein complex 4 deficiency causes severe autosomal-recessive intellectual disability, progressive spastic paraplegia, shy character, and short stature. 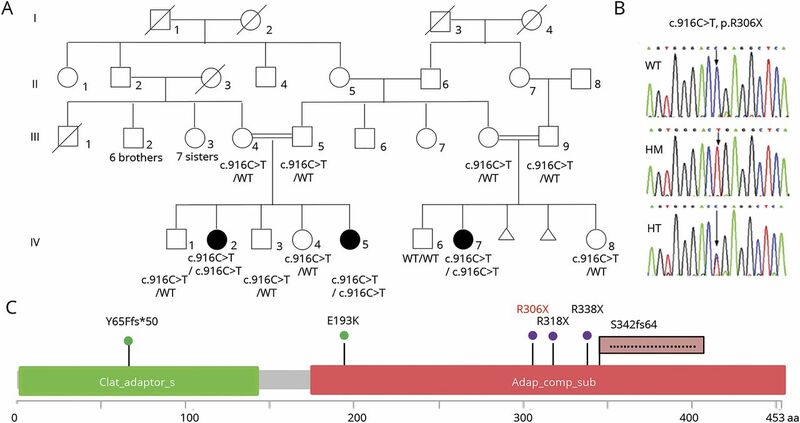 Am J Hum Genet 2011;88:788–795.
. An AP4B1 frameshift mutation in siblings with intellectual disability and spastic tetraplegia further delineates the AP-4 deficiency syndrome. Eur J Hum Genet 2014;23:256–259.
. Adaptor protein complex-4 (AP-4) deficiency causes a novel autosomal recessive cerebral palsy syndrome with microcephaly and intellectual disability. J Med Genet 2011;48:141–144.
. Autosomal recessive spastic tetraplegia caused by AP4M1and AP4B1gene mutation: expansion of the facial and neuroimaging features. Am J Med Genet A 2014;164:1677–1685.
. A new locus (SPG47) maps to 1p13.2-1p12 in an Arabic family with complicated autosomal recessive hereditary spastic paraplegia and thin corpus callosum. J Neurol Sci 2011;305:67–70.
. Review: insights into molecular mechanisms of disease in neurodegeneration with brain iron accumulation: unifying theories. Neuropathol Appl Neurobiol 2015;42:220–241.
. Neurodegeneration with brain iron accumulation: genetic diversity and pathophysiological mechanisms. Annu Rev Genomics Hum Genet 2015;16:257–279.
. Contiguous mutation syndrome in the era of high-throughput sequencing. Mol Genet Genomic Med 2015;3:215–220.
. Severe congenital microcephaly with AP4M1 mutation, a case report. BMC Med Genet 2017;18:48.
. Hereditary spastic paraplegia type 43 (SPG43) is caused by mutation in C19orf12. Hum Mutat 2013;34:1357–1360.
. AP-4 binds basolateral signals and participates in basolateral sorting in epithelial MDCK cells. Nat Cell Biol 2002;4:154–159.
. Coexisting variants in OSTM1 and MANEAL cause a complex neurodegenerative disorder with NBIA-like brain abnormalities. Eur J Hum Genet 2017;25:1–4.